Malvern Garden Buildings are proud to once again have supplied the buildings for the Artisan Retreats display at RHS Chelsea 2017. A Malvern Garden Building provides a versatile space for all manner of activities – from working and creating to relaxing and entertaining – as this year’s Artisan Retreats showed. With imagination and creativity, a garden building can become whatever you want it to be. Here we look back at the five artists who each transformed one of our buildings into their creative space. Bola Lyon is jewellery designer maker, based in South East London. “Hidden structures within anatomy” – such as Cancellous or soft bone, found in and around joints – inspire Bola’s work, and her working process includes porcelain clay and sterling silver. Bola’s retreat was a light and airy space, displaying visuals of her inspiration, the tools she uses and, of course, her beautiful, delicate jewellery. Bola’s work can be found at Waterperry Gardens Gallery in Oxfordshire, or online at www.bolalyon.com. Available in 12 sizes, the Ashton – part of the Malvern Garden Buildings Cottage Range – is suitable for an array of spaces. 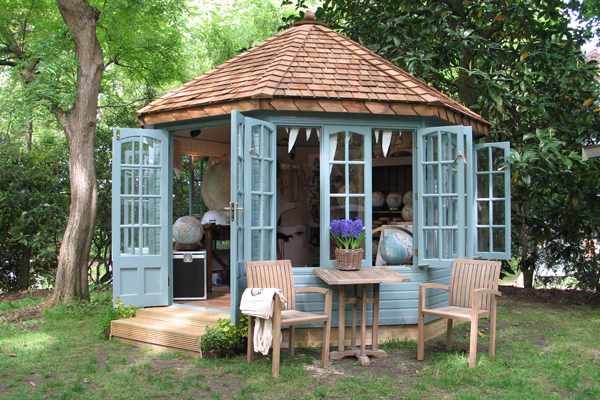 Although a classic English summerhouse, the striking colourway used for the Artisan Retreat at RHS Chelsea demonstrates how the building can be a bold statement in the garden, just as much as a traditional-style outdoor building. Linley creates bespoke furniture, interiors, collectable pieces and luxury accessories that showcase the finest in British design and craftsmanship. Based around the concept that it takes roughly ten thousand hours of practice to achieve mastery in a chosen field, the Linley artisan retreat celebrated the journey craftsmen and women go on to become masters of their chosen art. In 2016 – Linley’s 30th anniversary year – the first Linley Summer School was launched, to “encourage and foster a new generation of master furniture makers”. Eight students, chosen from the best design colleges around the country, came together to start their 10,000 hours in a beautiful 15th century thatched barn in Wiltshire. 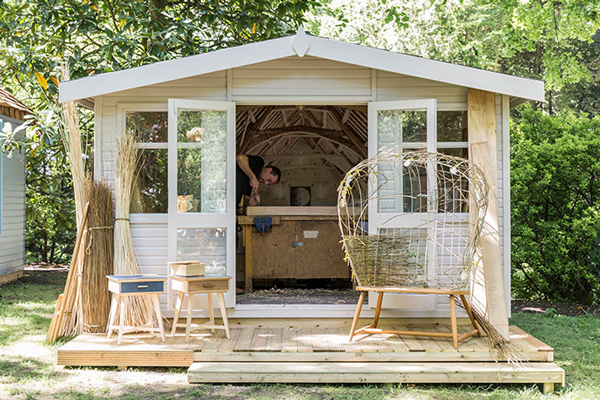 The RHS Chelsea artisan studio replicated the school, with a traditional workbench and tools and a teacher and student working throughout the show, making a marquetry chair to be used on the Gingko stage. Find out more about Linley at www.davidlinley.com. The Arley Apex is a beautiful cedar garden room from the Malvern Garden Buildings Traditional Range. It offers wide scope for customisation with options including coloured external finish, internal partitions, Georgian-style windows and a number of roof styles, all of which can change the aesthetics of the building to suit your personal taste. Find out more about The Arley Apex. Naomi grew up on a farm in Sussex where she would make things from found objects, so creating has always been something she has relished. At their studio in East London, Naomi and her team handcraft their pendants and lighting designs in house, creating artisan lighting solutions for projects both large and small, commercial and residential. Their ethos is to design for longevity through simplicity and sensibility. As well as showcasing their handcrafted lights, they made a bright and beautiful visual display of the materials they use inside their Artisan Retreat. Find out more about Naomi’s work at www.naomipaul.co.uk. 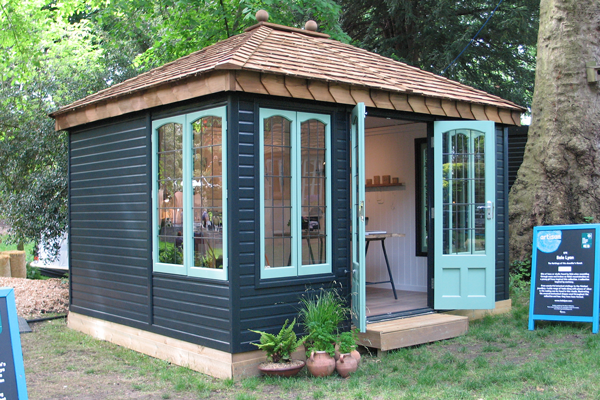 The Studio Pent is a wonderful garden office from the Malvern Garden Buildings Traditional Range. Double glazed, glass-to-ground windows make it the perfect space to relax, reflect or create, and the recent option of adding an open-sided extension to the building gives the building another dimension. 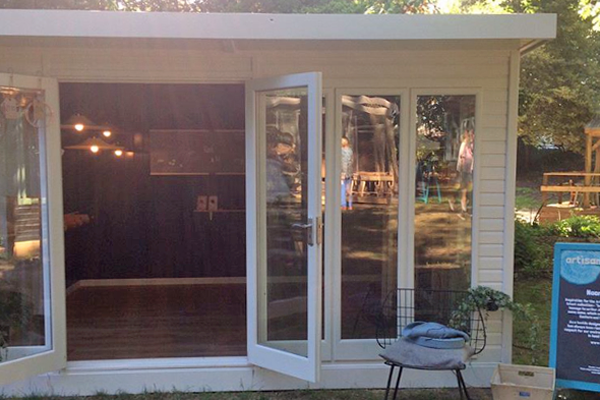 Find out more about The Studio Pent. Transforming their own garden at home was the start of the magazine’s creators’ passion for the outdoors. They believe connecting with the natural world makes life better, and so “Rakes Progress is as much a snapshot of the world beyond your computer’s window as it is a guide to the tricky business of growing stuff”. The magazine combines gardens, plants and flowers with photography, bees, tools, craft, architecture and clothes. To celebrate their involvement with RHS Chelsea 2017 and the Artisan Retreats exhibit, their current issue is a Chelsea special. Their retreat featured a stunning floral installation as a centerpiece. Find out more about the magazine at www.rakesprogressmagazine.com. 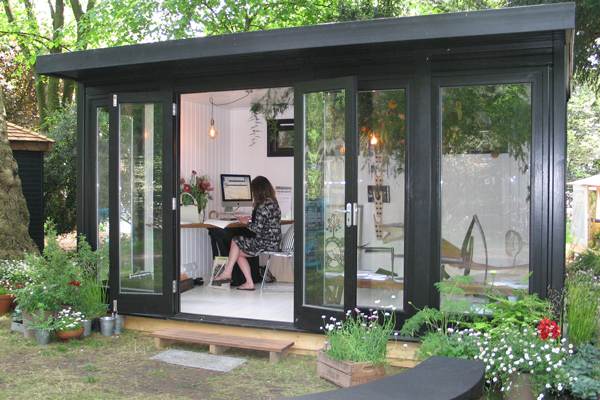 The Hanley garden office from Malvern Garden is available in an extensive range of sizes and made completely to your specification. Fully lined, insulated and double glazed, it provides a year round garden retreat, with a contemporary feel thanks to the glass-to-ground glazing. Find out more about The Hanley. A decision to make a globe for his father’s 80th birthday present, having been unable to source a suitable alternative for two years, lead to the eventual formation of Bellerby & Co – a small team of trained globemakers who hand make high quality globes used in TV productions and movies, as well as being stocked at Harrods. Each piece is expertly crafted using traditional and modern globemaking techniques, at Bellerby & Co’s North London studio. They turned their Artisan Retreat into a full blown globemaking workshop, detailing the steps and processes involved in this beautiful craft. Find out more at www.bellerbyandco.com. The elegant and classically designed Hopton from the Malvern Garden Buildings Cottage Range will enhance any garden. The octagonal design of the building allows it to fit well into numerous positions within an outside space. The cedar shingle roof and Georgian-style windows create an attractive exterior, whilst the opening windows allow sunlight and fresh air to flood in – the perfect environment to contemplate, relax or create. Find out more about The Hopton. The interior of the “Old Man’s Shed” is reminiscent of days gone by, and epitomises the much-loved shed as an escape in which to potter around and wile away the hours. 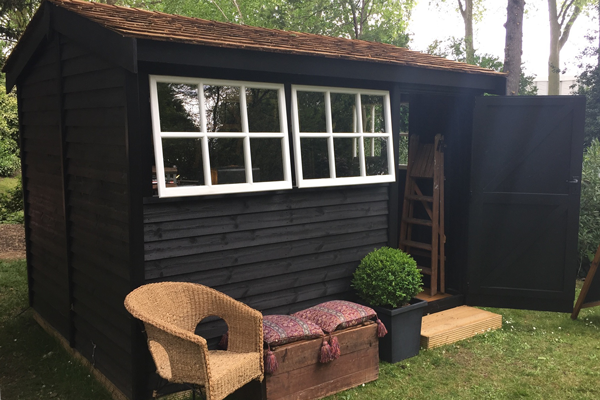 Although part of the Malvern Garden Buildings Shed & Workshop range, the Holt is a high quality garden structure that can act as much more than just a storage space. With an apex, cedar shingle roof and Georgian-style windows, the Holt is an attractive building, and the perfect for indulging in your favourite hobby or craft. Find out more about The Holt. As always, RHS Chelsea 2017 was a great show for Malvern Garden Buildings – alongside hosting the Artisan Retreats exhibit, we also revealed our Kew Collection with great success. We look forward to next year!